Multi-instrumentalist and producer Billy Sherwood must have a pretty impressive Christmas card list, if the guest stars on this album are anything to go by. Earlier in the year, he pulled together a dream lineup of talent from the likes of Yes, King Crimson and Gong for a project called The Prog Collective. Just a few months later, the cast list is even more staggering on The Fusion Syndicate, the second of a one-two riff on beloved (or derided, depending on which side of the fence you are on) musical genres from the early ’70’s. Name any significant fusion or progressive band or artist from that era, and the chances are that someone associated with them will be on this album. From Yes, Mahavishnu Orchestra, King Crimson, Genesis, Hawkwind, Gong, Weather Report, Soft Machine and Brand X, to sidemen for Frank Zappa, Chick Corea, John McLaughlin and Allan Holdsworth (not to mention … ahem … Billy Idol), all the boxes are well and truly ticked. Each guest appears on one track only with Sherwood acting as the glue that binds it all together, conceptualizing, writing, producing and playing all the instruments (keyboards, guitars, drums) not handled by the guest list on any particular track. Ever wondered what a super-session featuring members of Hawkwind, Yes and Mahavishnu might sound like? No? Album-opener Random Acts Of Science gives a clue, with solos taken in turn by Nik Turner (proving he can play it straight, rather than just employing his usual blow-and-hope approach), Rick Wakeman and violinist Jerry Goodman, plus Sherwood sounding sharp on guitar. John McLaughlin’s electric work is probably the closest touchstone for this track. On Stone Cold Infusion former pop-punker, but undercover progfan, Steve Stevens provides lead guitar, while former King Crimson saxman Mel Collins and Dream Theater’s Jordan Rudess trade solos over the solid bass work of Porcupine Tree’s Colin Edwin and drums of Billy Cobham, who’s 1973 Spectrum album could be accused of bringing fusion into the mainstream in the first place. As is the case throughout the album, the standard of musicianship here is just astounding, but rarely feels forced, with nobody trying too hard to steal the show. Billy Sheehan’s bass is prominent on Molecular Breakdown, playing some crazy scales and time signitures, while Jay Beckenstein (Spiro Gira) blows a mellow sax, making it sound more like a violin at times, and Billy Sherwood brings out the occasional guitar shred; Porcupine Tree’s Gavin Harrison provides drums. Larry Coryell’s electric and acoustic guitars are prominent in Particle Acceleration, while Sherwood pulls some Jeff Berlin-style bass tricks out of the bag. Chick Corea-sideman Eric Marienthal adds some tasty sax, which brings to mind David Sanborn albums from the 1980’s. Dixie Dregs and Deep Purple Blackmore-replacement Steve Morse takes a few uplifting guitar solos on At The Edge Of The Middle, Randy Brecker adds some trumpet, and Percy Jones puts in some fat and slinky basslines, while jazz pianist Jim Beard tinkles the ivories with tasteful manner and blinding speed. Atom Smashing combines the talents of guitarist John Etheridge, periodic Yes keyboardist Tony Kaye and Zappa-drummer Chad Wackerman for a convincing jazz-funk workout. Closing track In The Spirit Of … combines the guitar of Steve Hillage with keyboards from Scott Kinsey (Tribal Tech), sax from Theo Travis (Soft Machine Legacy) and Tool’s Justin Chancellor on surprisingly jazzy bass. Each of these tracks is about seven minutes in length, and with few real hooks, the songs start blending together after a while, something which is not necessarily a bad thing. 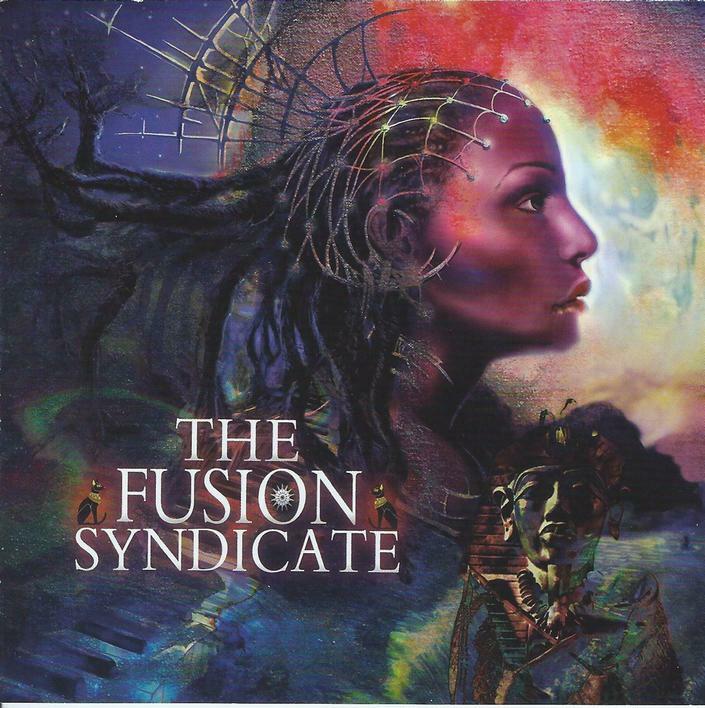 As an updating of the classic fusion sound from the ’70’s, The Fusion Syndicate delivers in spades, and will appeal to fans of all the jazz names (if not the rock artists) here, while the standard of virtuoso musicianship will leave listeners gasping for breath and grasping for more of the same. As Rick Wakeman says, “[It’s] always a pleasure to work with Billy Sherwood and all the other musicians he chooses. Add some great music and the combination is complete”.